If your mobile phone is not up to the job of efficient Internet browsing just yet then there are other ways to receive up-to-date information on your mobile when you’re on the move. The text messaging and picture messaging facilities on mobile phones are a great way to exchange information with friends and family. However, although no doubt adept at offering up the latest gossip and goings-on, they’re probably not so clued up about up-to-the-minute news headlines, sports scores, weather forecasts or horoscopes. It’s fortunate then there are web services dedicated to offering the latest information updates in the form of text and media alerts. If you are on the move and don’t have access to the TV, radio or Internet and want to be kept updated about the latest traffic news or football results, for instance, then you can subscribe to a service that will sends updates to your mobile in the form of text messages. For example, the acclaimed UK Internet news site Guardian Unlimited offers specific alerts for media, news, politics, goals, business, and even the Glastonbury music festival. As long as the phone is on a digital network, such services are generally available to all mobile phones, regardless of make, model or network. Kicking off a subscription simply involves sending a text message with the keyword for the desired alert to the service provider’s dedicated number. Payment is typically on a pay-as-you-go basis, so you just pay every time you receive a text message. If you are a contract customer then you will be charged via your monthly mobile bill, whereas pay-as-you-go customers will pay immediately using their pre-pay credit. The cost of individual texts may vary but shouldn’t really be more than 25p. If you want to take advantage of your mobile phone’s more advanced capabilities then there are alerts available that are much more sophisticated than the efficient but bog standard text. A media alert is a picture message rather than a text. This means it can contain both text and pictures, and sometimes even sound. The text itself can be up to 1000 characters, which makes it much more detailed than the standard text, which doesn’t go beyond 160 characters. 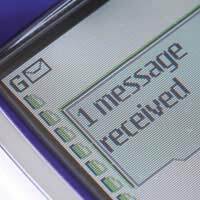 As they use more advanced mobile technology, media alerts are not available to all mobiles phones, only those with picture messaging and the appropriate settings. Subscription to a media alert service works in the same as a text alert but in being more elaborate the cost of individual alerts is typically higher, and can be as much as 75p. Back at the turn of the century, it was widely thought that Wireless Access Protocol, or WAP, would supersede such information services. Mistakenly seen by some as a feeble Internet browser, WAP wasn’t designed to put ‘the Internet in your pocket’ but instead give users access to up-to-date information via dedicated WAP pages. Although text - and media alerts - will likely become redundant when the Internet becomes cheap and ubiquitous on mobile phones, they have shown great resilience in providing a useful service for mobile users. They are proof that, of all the many features of mobile phones, text is still the best!